This year I am resolved to keeping on the sunny side of life. I know some days will be more challenging than others but I am, nevertheless, committed to focusing on the positive and always keeping my eyes open for the cloud’s silver lining. For if there is one thing I have learned during the past several years of intentioned self-discovery it is this: though we cannot change the past that has shaped us we can learn to control our responses to it. To me this means working to shift from the negative position of one who merely survives to learning to embrace life’s possibilities as one who thrives. To illustrate I’ve chosen an image of the sun rising over a city that, from its own devastation, became a thriving modern metropolis — Hiroshima, Japan. 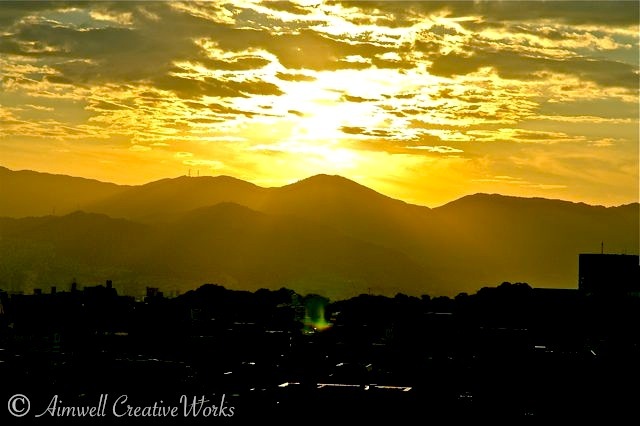 This entry was posted in Inspiration, Japan, Life, Musings, Personal Growth, Photography, Reflections, Thoughts, Travel, Uncategorized, Weekly Photo Challenge and tagged inspiration, Japan, landscape, Light and shadow, mountains, Photography, postaday, self-discovery, sunrise, Travel. Bookmark the permalink.